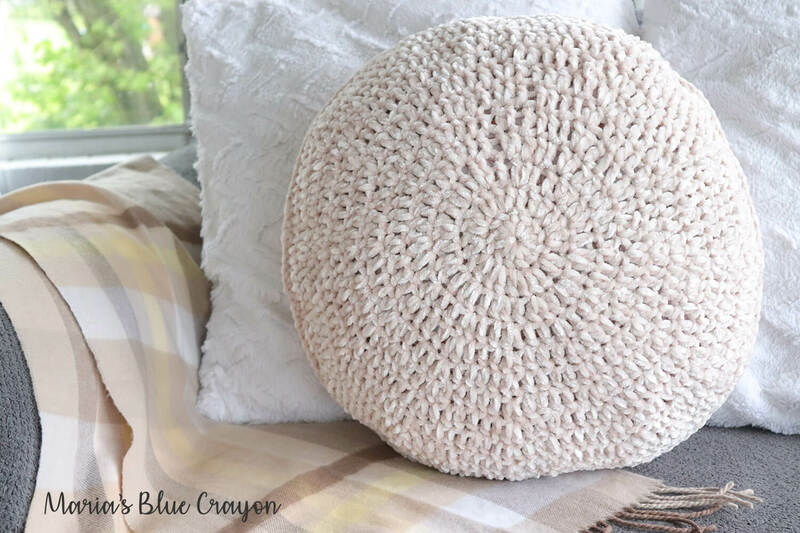 GET THE FREE PDF DOWNLOAD FOR THE CROCHET VELVET CIRCLE PILLOW BELOW. 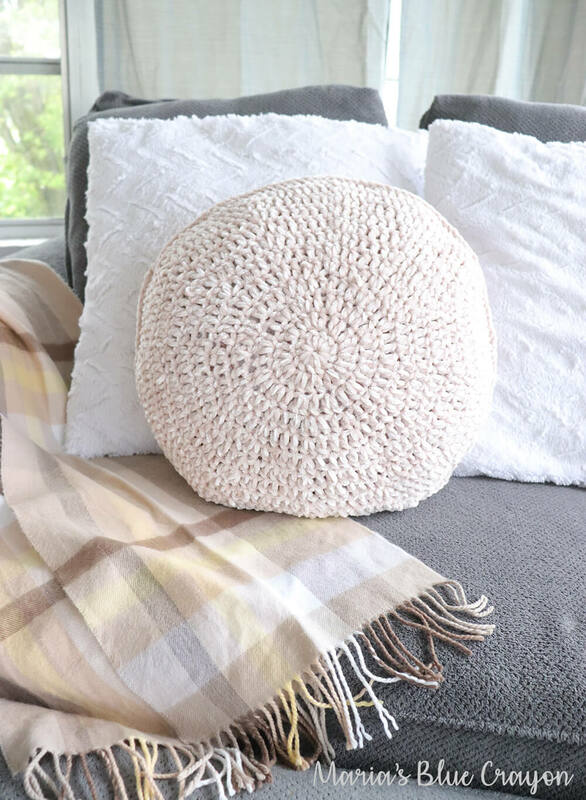 Let me start by saying – velvet yarn is thee yarn you will want to snuggle up in and never part with. It’s funny because the first time I came into contact with it, I didn’t give it a second look over. I think it was Yarn Bee from Hobby Lobby where I saw it first. I just didn’t have any ideas of what to do with it and walked on by. Fast forward to this past weekend when I found the Bernat Velvet at Michael’s and I’m obsessed. They come in big 315 yard skeins in various beautiful colors. They immediately reminded me of the velvet dresses I wore as a kid in the 90s. Burgundy, deep purple, navy, and teal green – plus they have pretty neutrals! I originally wanted the burgundy but my store was out of them (thank goodness for online shopping! ), so being the impatient person I am I picked up the Sandy Cream which is such a pretty neutral. 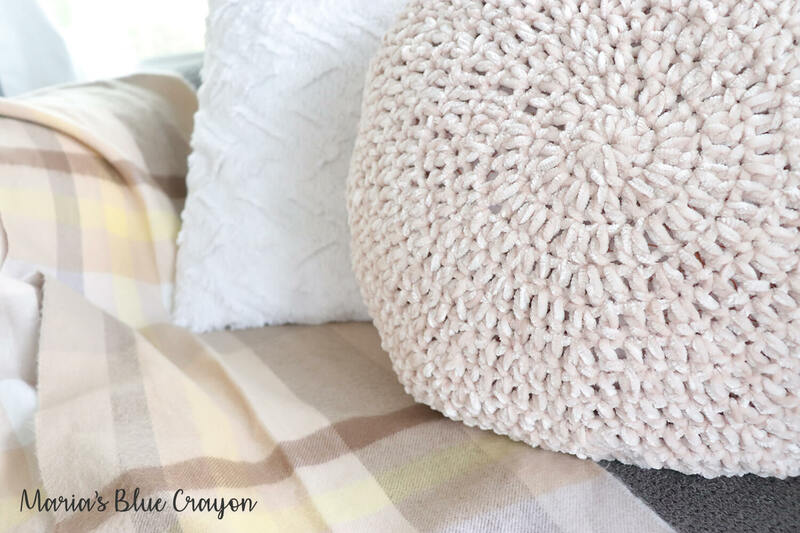 I worked up a swatch and knew I had to make a pillow – the softest, comfiest, and squishiest pillow! I loved working with this yarn so much, I finished this project in one day (I even sewed a pillow form for it because I didn’t want to wait to get one in stores!). I immediately started working up another pattern after finishing this one too! I just love how it works up and how soft it is. This velvet yarn has got me sold. I have so many more projects I want to make with it! I just want to live in this yarn, it’s that good. 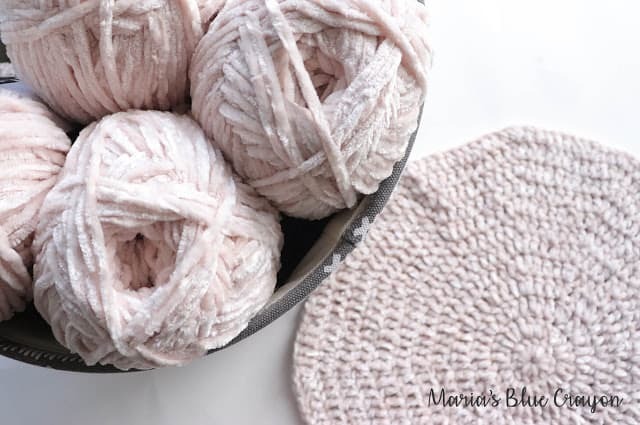 Stay tuned for more projects using this velvety yarn goodness! You can sign up for my email list so you don’t miss out. 🙂 SIGN UP FOR MY EMAIL LIST HERE. FREE PATTERN PDF DOWNLOAD HERE. PLEASE SHARE ANY WAY YOU CAN – GIVE IT A HEART ON RAVELRY, SHARE ON PINTEREST AND FACEBOOK – IT HELPS MY BLOG GOING AND THE FREE PATTERNS COMING! Beginning chain does not count as a stitch. The pillow will be made by crocheting two separate circles and then joined around the pillow form. With the wrong sides facing together, single crochet the circles together. Stop a little over 1/2 way around to put in the pillow form. Continue to single crochet around both circles to close it up. 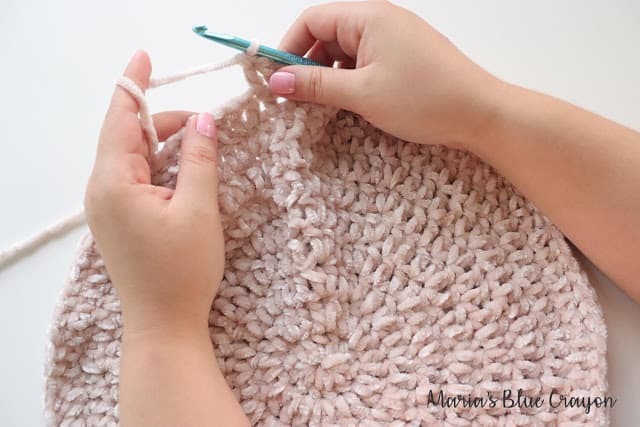 Join to first single crochet, fasten off, and weave in ends.